It is almost your restaurant’s D-Day and you are excited to share your great menu offerings and excellent dining services with the world. But, before that fateful day, you must first spread the word about your dining establishment. And the most compelling way to do that is by using restaurant grand opening flyers. Flyer designs come in many forms. There are flyers used for promotions, for information dissemination, or for a combination of these reasons. So, if you are just starting out a restaurant business, an aptly named restaurant grand opening flyer is the one you will need. 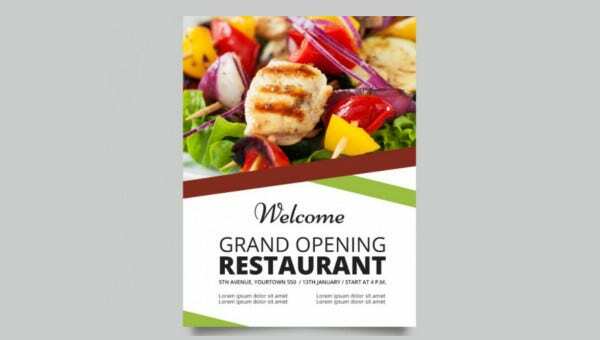 As its name implies, a restaurant grand opening flyer is a printed marketing material used for promoting a new dining establishment. These printed documents generally contain information about the restaurant and how customers can visit the place. Sometimes, it will also include opening day discounts or offers to help entice more customers to come to the restaurant. Restaurant promotion flyers also come in various sizes depending on the restaurant owner’s preferences. The common flyer print size is 4 inches by 11 inches. Thin, glossy papers are also used for most flyers. 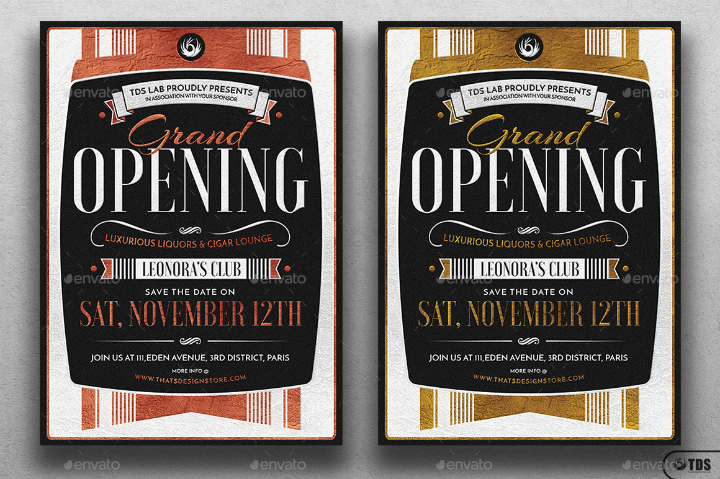 Starting off the flyer template collection is the Grand Opening Flyer Template (shown below). This template boasts a design made out of solid geometric shapes with a red background color. The use of red makes the flyer template totally eye-catching. But restaurateurs are not limited to this color. The template is fully editable and you may use any color palette depending on your preferences. This template’s download file is available in three different versions: Adobe Photoshop, Microsoft Word, and Microsoft Publisher. 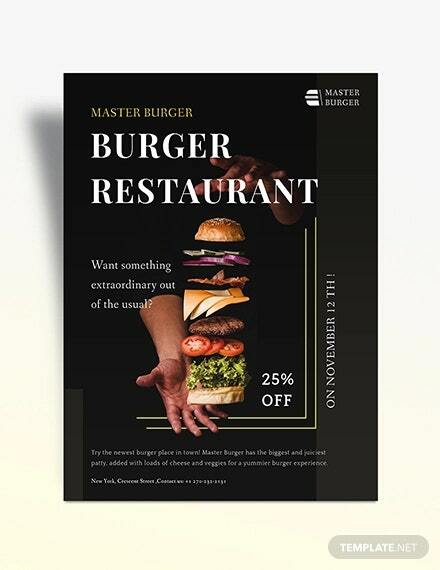 When using this flyer template as the base template for your restaurant’s print advertisement, do not forget to add your own branding elements and contact information. This makes it easier for guests to take note of and locate your restaurant at a later time. The Classy Grand Opening Flyer Template featured below is an example of a flexible restaurant flyer template design since it can be used for restaurant openings. This printable flyer template allows restaurateurs to visually create a bang for their store’s opening date. All graphics and text elements on the template are fully customizable, so adding, removing, or editing them will not be an issue. Note that end-users of the template will need to have access to either Adobe Photoshop, Microsoft Publisher, or Microsoft Word in order to open and edit the template. For best printing results, make sure to use glossy paper or thick cardstock measuring 8.75 inches by 11.25 inches. The template already includes a pre-formatted bleed area so you do not need to adjust for template margins. 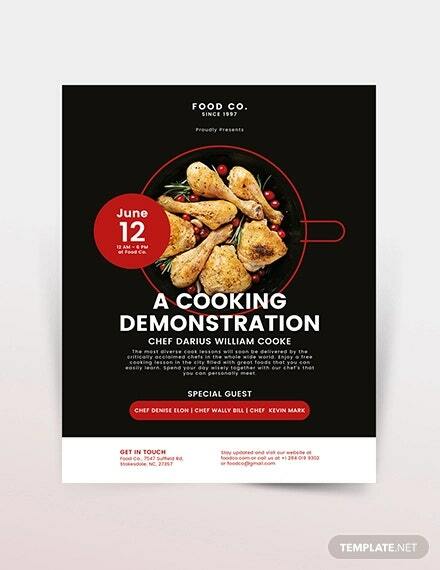 As its name suggests, the Chef Cookout Restaurant Grand Opening Flyer Template (shown below) best suits new restaurant openings that are headlined by a famous chef. This template also works well for barbeque restaurants, grill bars, and steakhouses. 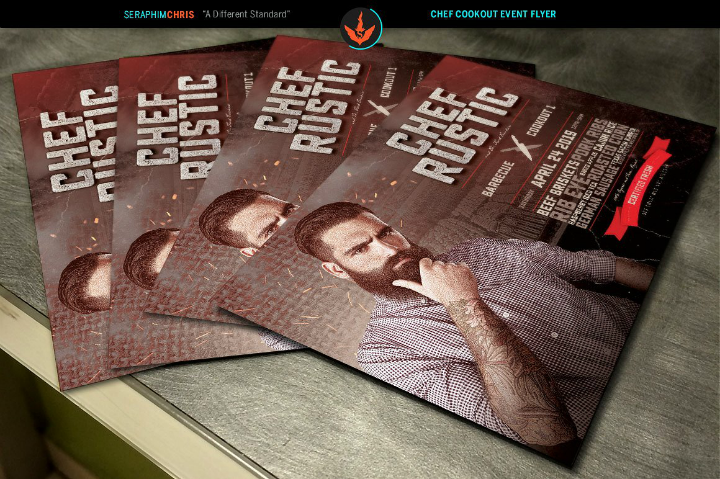 With a customizable template like this, you may easily replace the main image on the flyer template with a photo of your restaurant’s own chef. This is the perfect arrangement if you want to link your restaurant’s image to a star chef’s image. The printed version of this template measures 6 inches by 4 inches. Another full page version of this flyer template is also available for download if you wish to create a bigger flyer. With this template, you may also choose from six different pre-formatted color variations (blue, purple, red, sepia, gray, and teal). This template’s download file includes two PSD templates, a link to the free fonts used in the template, and a tutorial on how to use the template. Choose the Clean Restaurant Grand Opening Flyer Template embedded below if you want a simple and clean-looking restaurant opening modern flyer template. This printable template showcases a clean layout where users have the option to add a simple photo collage. The typography fonts and color scheme used in the template also help reestablish its modern and cool look. This template works well for trendy and high-end restaurants. This template set includes two different PSD template layouts and one square RGB layout for social media posts. The PSD template prints out on A4-sized paper. All templates sport a 3-mm bleed area. If you also want your restaurant social media banners to bear the same design as your marketing flyers, this flyer template may be the right one for you. 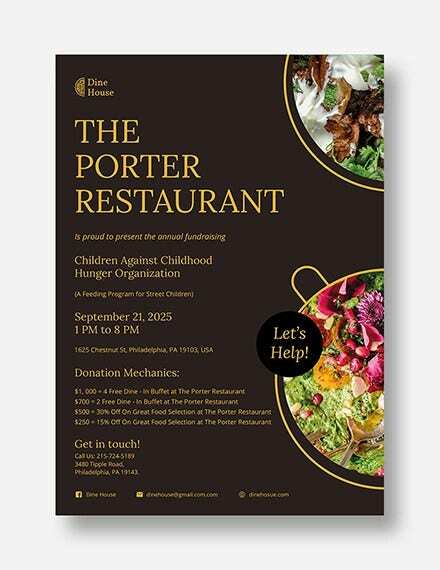 Need a flyer template design for the opening of your local restaurant, pub, or bistro? If yes, you will like the Dark Wood Restaurant Grand Opening Flyer Template shown below. With this template, you may use your own photo to act as the focal image on the template’s cover page. But you may also retain the current template image if this already matches your current restaurant offerings. The dark wooden background used in this template fits most restaurants that cater to families and a small-town clientele. This template download also allows you to choose from four different flyer sizes. These are A4, A3, 4 inches by 6 inches, or 8.5 inches by 11 inches. All templates follow the CMYK color model with a 0.25-inch printing bleed. Images also follow a 300 DPI screen resolution. 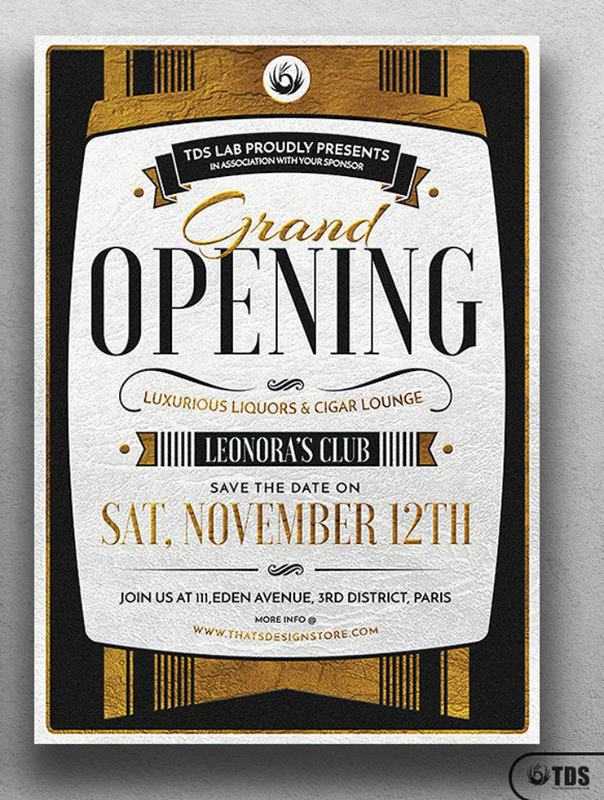 Why should you use grand opening flyer templates? Generating as much buzz as possible for your restaurant’s opening day should be what most restaurateurs aim for when developing their marketing plan. 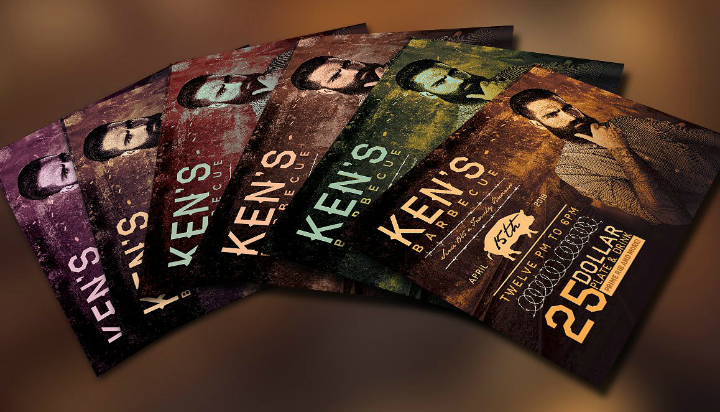 While it may be impossible for all new restaurants to use TV and radio promotions, they can always take a less inexpensive approach to the use of restaurant flyers. Listed next are a few benefits of using restaurant grand opening flyers as a promotional tool. Read on for more information. Using flyers as restaurant promotional tools allow restaurateurs to save money on advertising. As mentioned earlier, other more expensive alternatives are creating billboard and tarpaulin advertisements or TV commercials. Also, it may be best to first focus on local marketing, especially if you are only operating a small restaurant business. Using restaurant opening flyers is a good solution to that. 2. They are ready to edit. 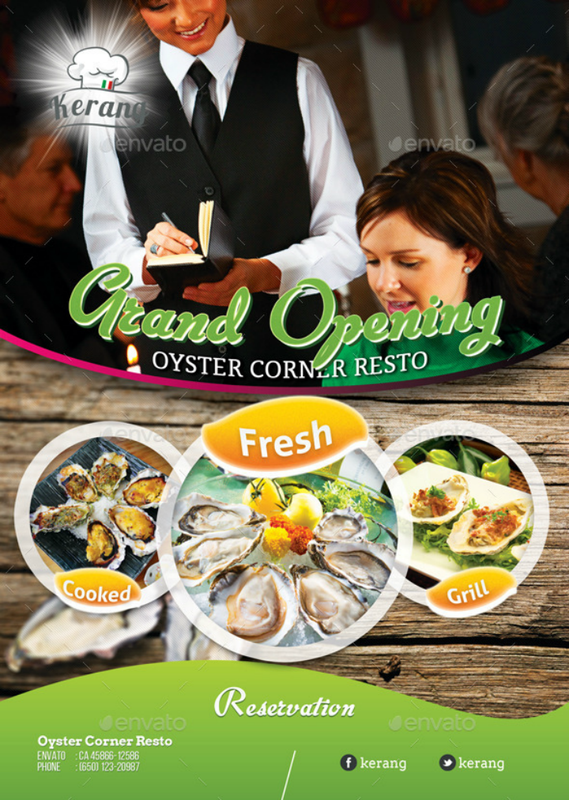 Most pre-made restaurant grand opening flyer templates are customizable. You are free to remove or add your own graphic design elements depending on your brand and personal preferences. This is very useful for restaurateurs who also want creative control over their restaurant’s stationery and advertising designs. Some pre-made flyer templates on this list are only editable by the template’s original creator. This arrangement is preferred by other restaurateurs who do not have a background in graphic design. 3. They are ready to print. Restaurateurs are busy people. 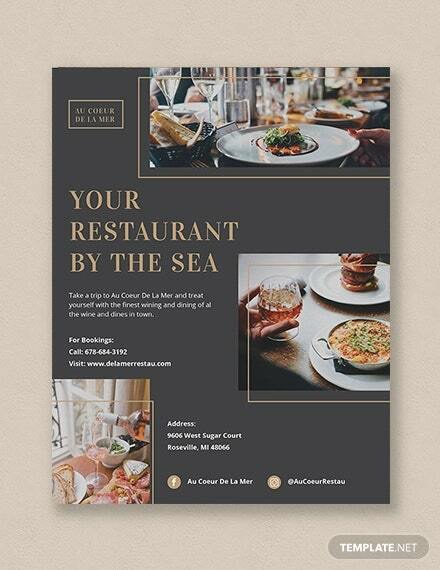 So if you prefer not to deal with the hassle of designing and printing flyer templates, it may be best to use a ready-to-print restaurant flyer template instead. This way, all you have to do is have the flyer template file printed out at home or at a printing shop, and you are done. This helps you save time in dealing with your restaurant’s advertising plans. Instead, you can focus on other aspects of running the business. 4. You save time when creating flyers. As mentioned earlier, using pre-made restaurant flyer templates allows you to save precious time in dealing with the business. Even if you are going to customize a pre-made flyer template, you are still saving yourself from the time consumption associated with creating a flyer template from scratch. 5. They can be given to a targeted audience or market. With your restaurant opening flyer templates, you have the freedom to choose from a variety of flyer designs without having to rack your brains to create your own flyer template. This means that you can specifically choose a flyer template that will best appeal to your target market. For example, if you are opening a trendy cafe restaurant, you would want to choose a flyer design that showcases an equally trendy and modern design. The different advantages of using restaurant opening flyer templates listed above are only the most common ones. There are other benefits that may only be applied to specific types of restaurants or to specific types of markets. Internalize these advantages so that you can help make a more informed decision when the time comes for you to choose your restaurant marketing plan. 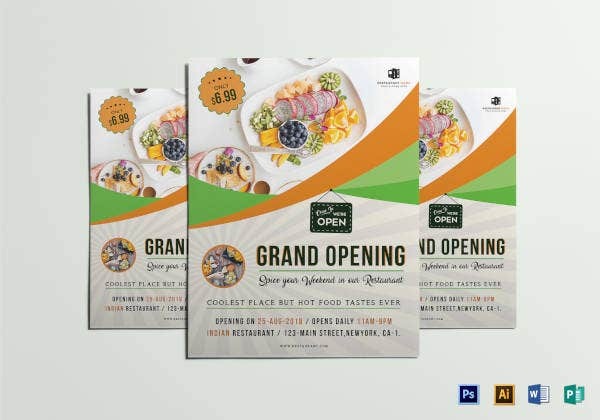 Embedded below are downloadable examples of grand opening flyer templates for restaurants. Freel free to browse through them so that you will know what flyer template will work best for your own restaurant. Note that these templates are downloadable and are available in either Adobe Photoshop (PSD), Microsoft Word (DOC), Adobe Illustrator (AI and EPS), and Microsoft Publisher (PUB) file formats. Another great grand opening flyer template is the Barbecue Restaurant Grand Opening Flyer Template (embedded below). This template works best for barbecue places, steakhouses, and sports bars. This template uses grungy textures that will appeal to less formal dining places, so use it accordingly. Each download file will include a full-page flyer template in PSD and another PSD template measuring 4 inches by 6 inches. It is fully editable so you are free to change up the images, font styles, font colors, and background colors used in the template. Tip: To personalize the template, do not forget to add your own restaurant logo design or social media links. Choose the Fast Food Restaurant Grand Opening Flyer Template shown below if you are launching a fast food chain. This template includes attention-grabbing designs that will work best to attract customers. All text elements in this template are customizable. You may also change the logo design used in the bucket illustration and replace this with your own restaurant logo design. The template may be resized depending on the flyer size you want. 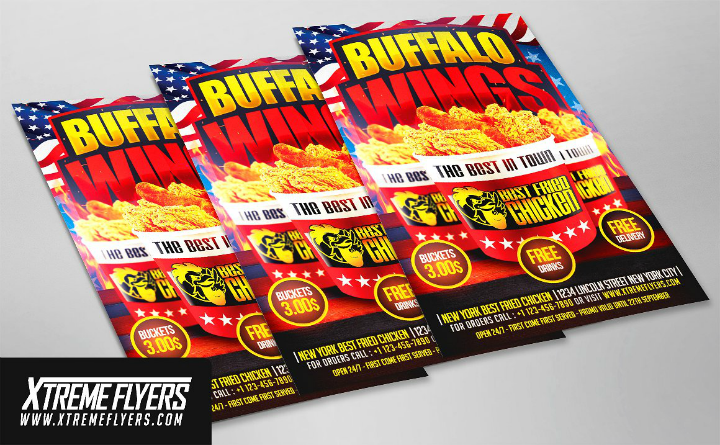 This business flyer template may be used for fast food restaurants, chicken restaurants, popcorn stands, and even food trucks. Need a restaurant opening flyer that exudes both elegance and luxury? If yes, try out the Gold Restaurant Grand Opening Flyer Template featured below. As its name suggests, this flyer template uses gold foil textures as part of the template design and in some of the text colors. This makes the flyer (and by extension, your restaurant) appear more expensive. This kind of flyer design is perfect for fine dining restaurants or for dining establishments that cater to a more affluent customer base. This template is available in two print sizes (A4 size or letter size 8.3 inches by 11.7 inches). It is also a customizable template that allows end-users to change all the text placeholders. To make the flyer design more original, do not forget to add your own restaurant branding elements. Also, note that the template does not include all the fonts used in the template. You first need to download and install them on your computer before they reflect correctly on the template. For those who are operating a specialty restaurant, you may look into the Grand Opening Seafood Market Restaurant Flyer Template shown below. This vector illustration follows a simple red and blue background color scheme with a prawn icon acting as the restaurant logo. 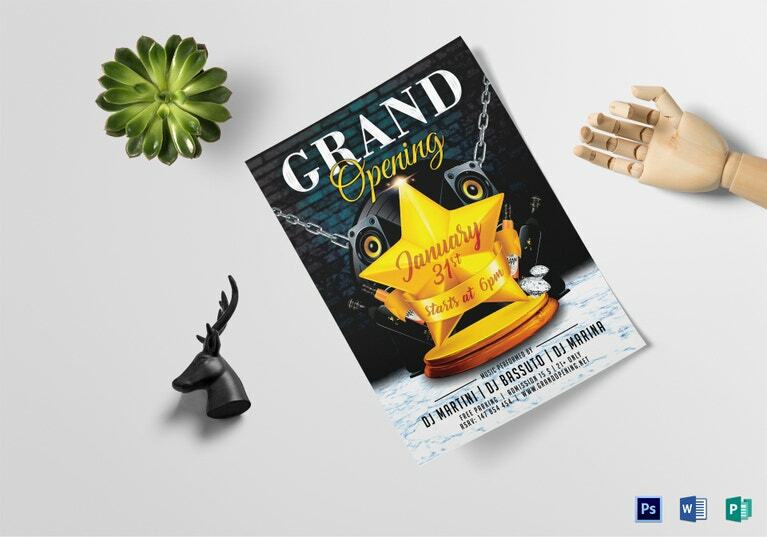 To personalize this restaurant grand opening flyer design, you may always replace this with your own logo design depending on the specialty seafood you are selling. Check this article for more useful tips for logo designing. Since this is a vector flyer template, it can be easily resized to the flyer size of your choice. Just remember not to stretch the template too much as this may distort the template’s appearance. The Luxurious Restaurant Grand Opening Flyer Template shown above is another flyer template set that will fit fine dining restaurants. This template is available in rose gold and gold color variations. They print out on A4-sized paper and cardstock. These templates are all ready to print right after making edits on the text placeholders in the template. Are you opening a Mexican restaurant? If yes, the Mexican Restaurant Grand Opening Template Set featured below is the perfect print advertising solution you are looking for. Grand opening flyer templates for restaurants also work as restaurant invitation cards since they aim to entice customers to your newly opened restaurant. 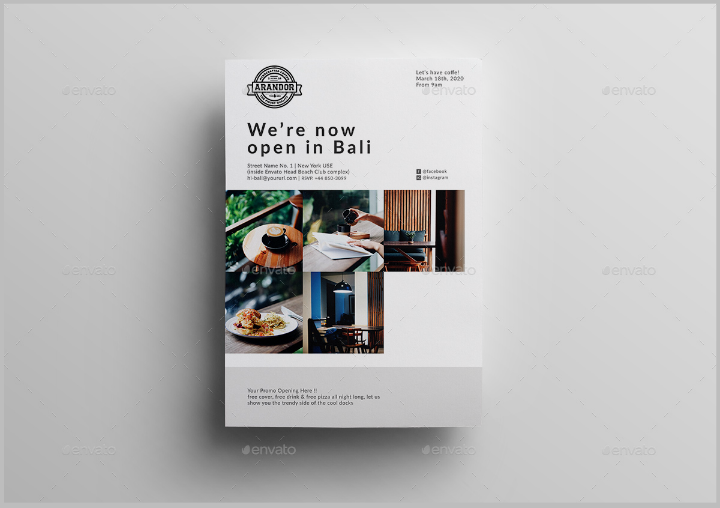 If you want to create a simple restaurant opening invitation at a fraction of the cost, choose this template vector design. This flyer template follows a double-sided format and it may also be used as a restaurant coupon. This template follows a red and green background color scheme, but it may be changed based on your restaurant’s official color motif. You may also change the food icons used in the template to reflect the specific icons that your restaurant uses. 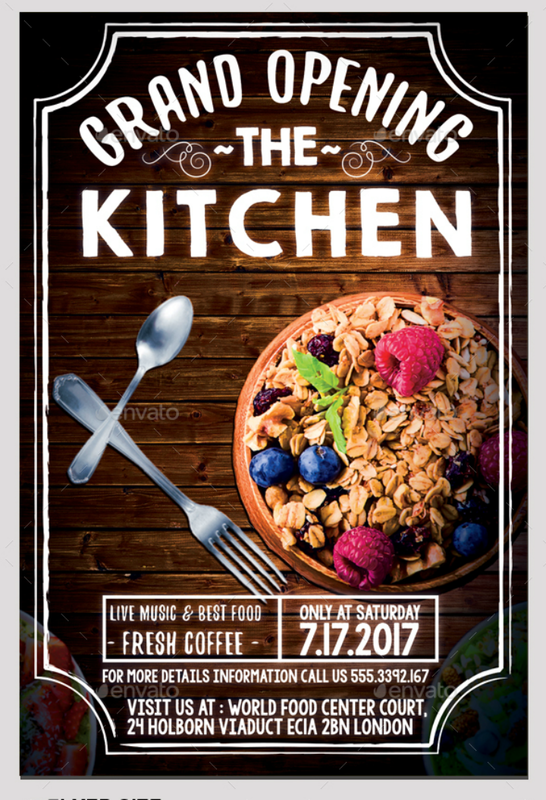 The Natural Restaurant Grand Opening Flyer Template shown below boasts simple flyer designs that do not overwhelm its readers. Choose this template if you wish to highlight a dish or meal that your restaurant offers. This flyer template is available as a digital file download. The creator of this template offers free editing and customizations before the final version is sent to you. The final template is sent as a PDF file and is printable on any standard letter size paper (8 inches by 11 inches). And since the customization is done by the template’s creator, you will need to send your food photos. Make sure that these photos are taken well. If you have the budget, you may hire a food photographer to ensure that you get high-quality photos of your restaurant’s menu list. Also, remember to use your own restaurant logo design or emblem to make the template stand out more. Check this article for more free logo designs you can use. Sustainable farming the and organically sourced food is an increasing trend these days. So, if you intend to break into this market with your very own organic restaurant, try out the Organic Restaurant Grand Opening Flyer Template (featured below) for your dining establishment’s launch date. As a restaurant advertising template, this flyer template design includes the basic information about the new restaurant and a free meal coupon that customers can use on opening day. Note that this is a PSD template, so you will need to have Adobe Photoshop (or another compatible software tool) installed on your computer before you can edit the template. This template prints out on paper and cardstock measuring 5.25 inches by 7.25 inches. It is fully editable and you can change up any template layers and designs. Changing the template’s color scheme is advisable if you wish to follow your restaurant’s color scheme. The Seafood Restaurant Grand Opening Flyer Template shown below is another flyer template created specifically for seafood restaurants. Despite this, it may still be used by different kinds of restaurants that offer specialized cuisine as long as the identifying design elements are customized or replaced. To make this restaurant flyer template work, make sure to use your own seafood dish images. It will also work if you choose pictures of actual people eating in your restaurant. This will make the flyer appear more realistic. More customers appreciate this approach in restaurant marketing. This template is available in three color variations (orange, green, and gray). The template follows the CMYK color scheme and all images used have a 300 DPI resolution. It prints outs on paper measuring 147 mm by 209 mm and has a pre-formatted 3-mm printing bleed area. Tip: Remember to have Adobe Photoshop installed on your computer since this is a PSD template. Choose the Simple Grand Opening Restaurant Flyer Template shown below if you want a traditional approach to flyer template design. This template follows a 5.25-inch by 7.25-inch layout format. Make sure to use paper or cardstock with these measurements if you do not want to cut out the flyers after printing them. The template also has a 300 DPI image resolution. Using this template for your restaurant’s grand opening will make the event more festive since the template follows a red and gold color scheme. Aside from being used as a flyer design, this template may also be used as part of a restaurant brochure. Keep the template file saved on your computer if you intend to use it for other purposes in the future. What restaurant grand opening flyer template should you use? Your restaurant’s grand opening is only the beginning of a restaurateur’s journey in the food business. As a restaurant owner, it is your goal to make the business successful. This is done through two things: through food quality and through restaurant advertising. So, if you are just starting out, it is best to nail the restaurant marketing portion first. 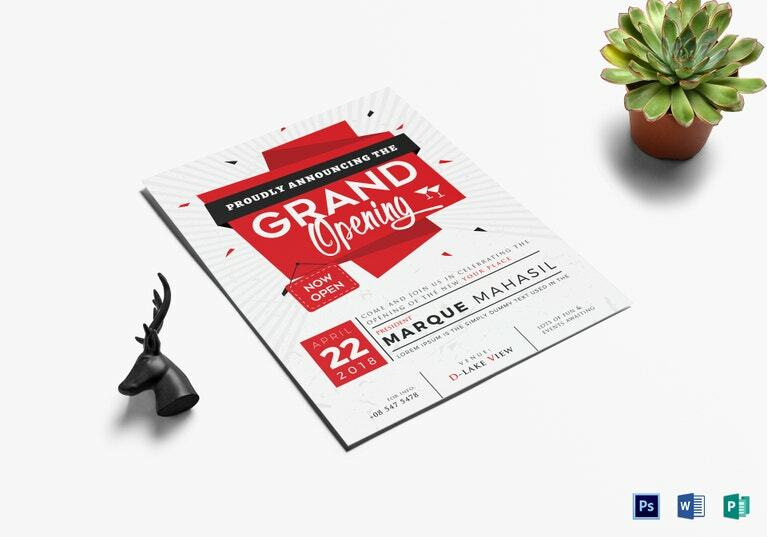 That is why, when choosing a grand opening flyer design, select a template that will increase your restaurant brand’s recognizability. 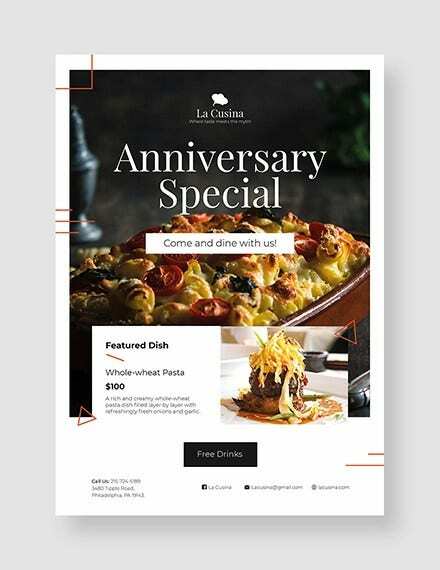 Choose the restaurant grand opening flyer template that is already equipped with the same restaurant design elements that you are already using for your restaurant. This helps decrease the work you need to do for the brand image design. Also, choose a flyer template that can function as other types of restaurant advertising templates. Again, this will make the entire restaurant marketing process easier. If you found this article useful, do not hesitate to bookmark it and share it with your other business owner friends!